I've been using sentora 1.0.3 for almost three years. As recently, we almost all understood that Zpanel's so-functional and tacit successor remains unsupported. I want to ask, realizing that I do it at my own risk, how can the PHP version up to 7 be updated? At the moment, I've only been able to upgrade to 5.6 via an extension to choose a version against the domain. I'm using Ubuntu 14.04 LTS. Thanks! I guess the first question to ask you is which extension are you using to allow you to choose a PHP version? I am experimenting with Sentora on PHP 7 and would like to help you, and if I can integrate something with the extension you use then even better. If not, do you have access to log into the server and run commands, edit files etc.? Using PHP Versions from TEC-Dynamics L.T.D. , this is the only way to use a newer version of PHP for now. It looks like that module is no longer available - and I'm not so sure that it implemented security and protection properly (suhosin etc.)? It would probably be better to look at upgrading PHP to version 7 using direct server access - as long as you can do this, and that you understand that PHP 7 is not officially supported or recommended by the Sentora developers at this stage. Yes, i have access to server and i understand. How to do it? (01-21-2019, 04:10 AM)fearworks Wrote: It looks like that module is no longer available - and I'm not so sure that it implemented security and protection properly (suhosin etc.)? It would probably be better to look at upgrading PHP to version 7 using direct server access - as long as you can do this, and that you understand that PHP 7 is not officially supported or recommended by the Sentora developers at this stage. (01-21-2019, 04:18 AM)georgi_arsoff Wrote: Yes, i have access to server and i understand. How to do it? I am still testing my implementation so am not ready to give out details just yet, but you need to know that I am talking about installing a replacement version of PHP, not adding another one that you can choose from. This means that, on an unmodified server, the installation of PHP 5 is no longer used by any part of Sentora. Also, I have no idea how this module has modified your server but from the thread I have read about this module (here: http://forums.sentora.org/showthread.php?tid=2808) there is a change implemented that alters how PHP communicates with Apache (it alters Apache to use mod_fastcgi I believe? ), and I'm afraid I cannot tell you how to do the equivalent with PHP 7 once you have it installed. So that means I can share with you how I have upgraded PHP on my server from 5 to 7, which affects ALL of Sentora and ALL vhosts, but as the module is no longer available, and is unsopported/insecure, I would not want to pursue modifying any of the code that comes with that. 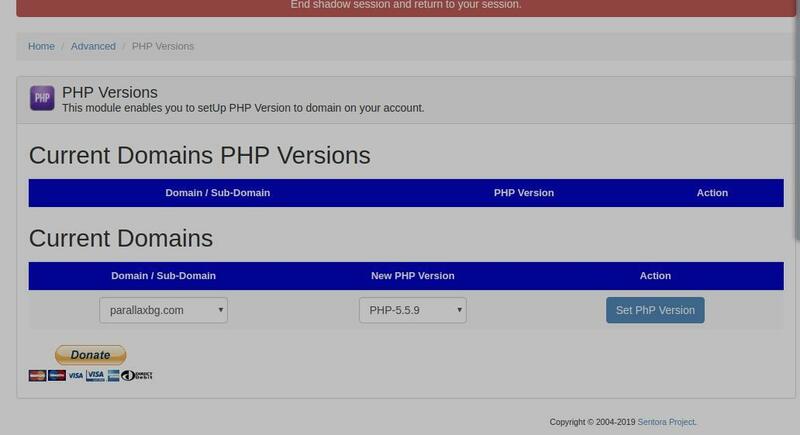 (01-21-2019, 04:31 AM)fearworks Wrote: I am still testing my implementation so am not ready to give out details just yet, but you need to know that I am talking about installing a replacement version of PHP, not adding another one that you can choose from. This means that, on an unmodified server, the installation of PHP 5 is no longer used by any part of Sentora. (01-21-2019, 04:32 AM)georgi_arsoff Wrote: Ok, share please. The extension can be removed, and it also has an impact when I set it for a particular directory or domain, it does not change anything in the other time. Share How To Become? He had a spare back. I will share as soon as I have finished my testing - not quite ready but keep a look out and I will try to post it soon. fearworks, check if you have an WordPress page, when you try to upload a plugin or theme, if it works. Because one of the problems of php7 installation is that messes with your upload folder permissions. (02-02-2019, 12:38 AM)ngeluis@gmail.com Wrote: fearworks, check if you have an WordPress page, when you try to upload a plugin or theme, if it works. I will try it on one of my test servers and see if I have any issues. Ok, I just tried it. No issues at all, all works perfectly. So if you've tried it and had issues then I guess that's some sort of config issue on your server or PHP ini file...?